Banners are something I don't make often but I do like to make them and I am always listening and watching for times I can make a banner project. I have a little friend who loves her glitter and I promised her I would make her a name banner for her bedroom and all I needed to know was what colors she wanted. And, if you are a little girl that names her pet bird Princess Poppy the only font that would be acceptable is Storybook! Storybook was one of my favorite Cricut cartridges because the wonderful fonts that looked so fancy with the layers available to dress up the letters and it worked wonderfully for the banner. If you know how expensive glitter paper is you know that you tend to find ways to add a glitter detail without using up the expensive glitter goodness of glitter cardstock and for this project I opted for that absolutely sparkly, glitter, shininess that only the Duck Deco Glitter Laminate can offer. If you haven't seen this stuff in person let me tell you that there isn't a picture available to convey how gorgeous this stuff can make a project! **Settings** I had to finagle *okie is always amazed that the word finagle is actually a word and it has to be since it never gets that red underline when she types it* with the settings to find the right one for the laminate. If you cut too strong it will cut right through the laminate and the backing sheet. I finally found that for the Explore the Washi Tape setting works quite well. Sometimes I did get a slight cut through the backing paper but for the most part it worked great. 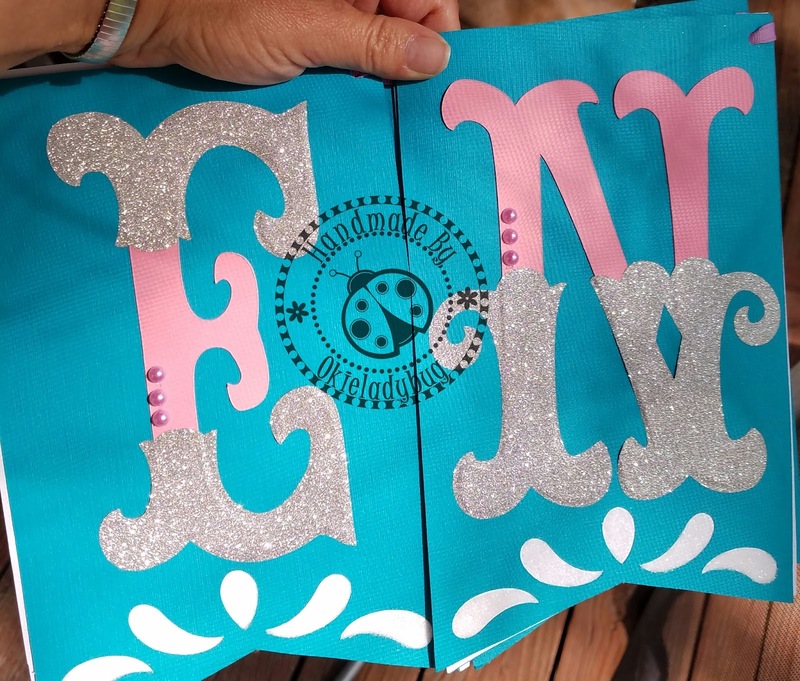 Once I had the letters on the banner pieces they seemed to need a little something else and I thought about my pearls I have in my stash of embellishments and they added that pieces de resistance we often strive for in our projects. My little friend was very pleased with her banner and as far as I know it is still hanging in her bedroom! Ohhhhhhhhh, I love this banner. I can just imagine how a young girl (or pre-teen) might be totally delighted with it. What a great way to decorate her room. I enjoy making banners too, but I tend to make them way too large. For example, by the time I completed the banner for my grandson's graduation party (which said "Congratulations Matthew, San Jancinto Graduating Class of 2015" - plus a few flags for grad caps, gowns and diplomas for decoration), the dang thing was nearly 30 feet long. Luckily the party was outside and they were able to hang the banner around the covered patio area. I like this better with just the name. This is gorgeous. But do tell how the glitter cut with the cutter. Was it easy to cut. Thank you for asking that! I meant to put in the post what settings I used on the Explore and I guess I overlooked that information. I used the Washi Tape setting that can be found in the custom settings. what a wonderful banner! Perfect for Princess Poppy's keeper! i don't know about the Duck Deco. will have to look into that! Carols banner sounds awesome as well. i had to chuckle with it ending up 30 feet long! what a project! Love your work. Thanks for sharing your awesome projects with us. i do enjoy your posts! My Crafting Days are Numbered!